Baseball history is filled with the storied achievements of 500 HRC members, such as Aaron, Mays and Sosa, who were able to hit long-balls seemingly at will. And when the greatest hitters in baseball got in the groove, they really put on a show! Two 500 HRC members are among only 15 players to hit four home runs in a single contest. Willie Mays did it in April 30, 1961 to lead his San Francisco Giants to a 14-4 victory over the Milwaukee Braves, Mike Schmidt matched the super-human feat on April 17, 1976 to give his Philadelphia Phillies team an 18-16 victory over the Chicago Cubs. 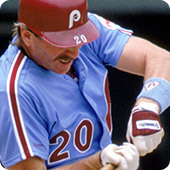 Harold Baines, Jeff Bagwell, Ernie Banks, Johnny Bench, Geronimo Berroa, Albert Belle, Barry Bonds, Bret Boone, George Brett, Gary Carter, Joe Carter, Roberto Clemente, Rocky Colavito, José Canseco, Eric Davis, Glenn Davis, André Dawson, Doug DeCinces, Carlos Delgado, Joe DiMaggio, Don Demeter, Cecil Fielder, Steve Finley, Jimmie Foxx, Nomar Garciaparra, Lou Gerhrig, Juan González, Goose Goslin, Frank Higgins, Bobby Higginson, Willie Horton, Reggie Jackson, George Kelly, Ralph Kiner, Dave Kingman, Tony Lazzeri, Edgar Martinez, John Mayberry, Willie Mays, Willie McCovey, Mark McGwire, Johnny Mize, Eddie Murray, Ben Ogilvie, Larry Parrish, Boog Powell, Manny Ramírez, Dusty Rhodes, Jim Rice, Alex Rodríguez, Babe Ruth, Hank Sauer, Mike Schmidt, Duke Snider, Sammy Sosa, Miguel Tejada, Frank Thomas, Jim Thome, Willie Stargell, Mo Vaughn, Larry Walker, Ted Williams. Sammy Sosa accomplished the feat six different times, while 1990s nemesis Mark McGwire hit three home runs in the same contest on five occasions. Barry Bonds thumped out three home runs during a single contest four times, including on August 27, 2002 when he led the San Francisco Giants to a 7-4 victory over the Colorado Rockies. Barry went 4-for-4 on the day with three solo shots and a double. Twenty-nine MLB players, including Alex Rodriguez, have hit three homers with more than one team, but A-Rod is the only player to ever do so with three different teams (Seattle Mariners, April 16. 2000; Texas Rangers, August 17, 2002; NY Yankees, April 26, 2005). Frank Thomas hit for the home run trifecta twice, the latest coming for the Toronto Blue Jays on September 17, 2007. On September 15, 1998, Manny Ramirez had a three-homer game against the Toronto Blue Jays, in the midst of setting a major league record for the most home runs (8) in five consecutive games. 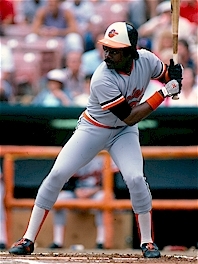 On the 19th, Man Ram hit two home runs in his first two at-bats for Cleveland tying a major league mark reached twice by Washington's Frank Howard in 1968. Jim Thome knocked out three titanic blasts on July 22, 1994 for the Cleveland Indians to help them defeat his eventual team, The Chicago White Sox, 9-8.